On Monday the New York Jets officially crossed one important item off their preseason to-do list, confirming veteran Josh McCown will take the reigns under center for the team in their first game of the season. It’s likely that that is a bit of coach-speak exaggeration, as last year’s starting guards James Carpenter and Brian Winters are both set to return. But beyond those two spots, the battle for the starting job at center and both tackle positions are still up in the air, with two men competing for each slot. The uncertainty leaves the Jets particularly vulnerable. While teams go into training camp hoping to find the right group of players to work together as a line, at some point a decision needs to be made so the five guys can get reps in with each other and start meshing. It’s the most “unit-centric” group on the field at any given moment, and as the Jets stand, their starting five’s first time getting extended playing time together might be in their season opener. 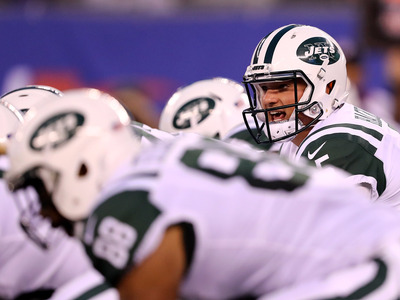 Beyond their to-be-determined line, the Jets offensive prospects don’t look much better. Newly named starting quarterback Josh McCown is a proven journeyman in the league, but his peak performance is probably best described as “serviceable” and at 38-years-old, those games might be few and far between. The Jets also have almost no receivers to speak of after Brandon Marshall signed with the Giants, Eric Decker was signed by the Titans, and Quincy Enunwa down for the season with a neck injury. Currently, the Jets receiving core includes names like Robby Anderson, Jalin Marshall, and Charone Peake. Altogether, the Jets offence as currently assembled will feature a subpar quarterback with no time to throw and no one to throw to. Handing the ball off to Matt Forte or Bilal Powell, and the backs might need to make two men miss before they make it back to the line of scrimmage. The Jets open the season September 10 against the Bills in Buffalo. Las Vegas currently lists the team’s win total over/under at 4.5.